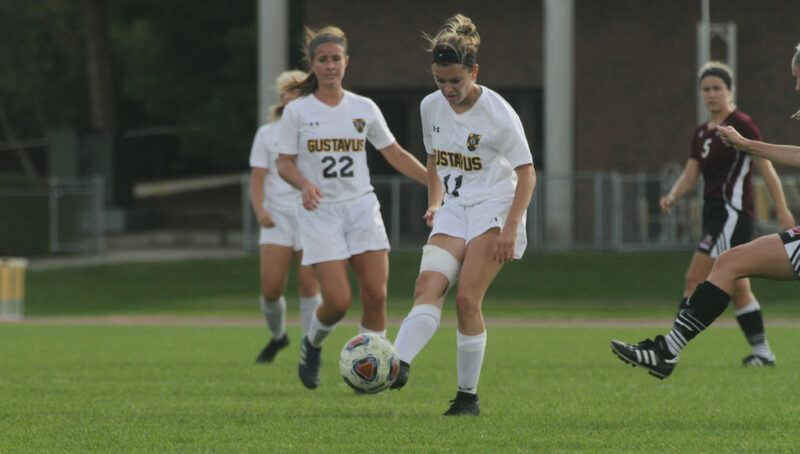 SAINT PETER, Minn. – The Gustavus women’s soccer team played a hard fought game against UW-La Crosse, but lost by a score of 5-2. With the loss the Gusties fall to 4-6-1 while the Eagles move to 8-2-1. The Gusties controlled the lead for a the majority of the game with Kylie Lamberty (Sr., Sioux Falls, S.D.) punching in the lone first half goal to give the Gusties a 1-0 lead at the break. The Eagles answered in the 49th minute but less than a minute later Emily Skogseth (Sr., Burnsville, Minn.) found the back of the net to give the Gusties the 2-1 lead. The Eagles found the net in the 54th and 57th minute to take a 3-2 lead before a lightning delay in the 74th minute put the game at a halt for over an hour. After the break it was all Eagles, as they found the back of the net two more times to give themselves a 5-2 victory. Leah Pavlish (Fy., Prior Lake, Minn.) got the start in net for the Gusties recording 14 saves while allowing five goals. The Gusties will be back in action on Saturday as they travel to Bethel for a 11:30 a.m. contest.